Donate just $20 to the UDCDA Monthy Raffle and be entered to win 12 monthly drawings starting January 13th and running through December 14th, 2016. Every 2nd Wednesday of the month, you will have a chance to win a $100 prize. In the las month, the UDCDA will celebrate with a final holiday drawing of $500! Each ticket gives you an opportunity to win 12 times for a grand prize total of $1,600. That’s less than $2 per chance! 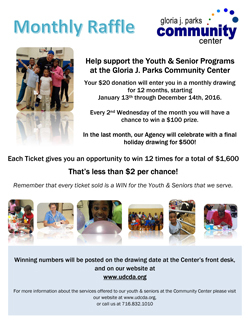 Remember that every ticket sold is a win for the youth and seniors we serve!